Last weekend I held my Tassievore Eat Local Challenge feast for my family. I invited my mum, Lil Sis and Mr Tall to join us. It’s the second time I’ve done one of these feasts, and I really enjoyed doing it. As a rule I don’t like to cook, but when it’s on a weekend and it’s something I can devote several hours to doing, rather than a rushed mid-week dinner, I do enjoy it because it becomes a bit of an event that I can totally immerse myself in. What did you enjoy most about hosting a feast? I enjoyed it all, from planning the menu, cooking the dishes and sharing them with my family. I was a bit worried that local produce might be harder to source in early winter than it had been in autumn, last time I did the challenge, but I was able to find everything I needed in the end. Yes I would. I didn’t go a huge way outside my comfort zone, and stuck with dishes I knew I could cook, rather than try something new on unsuspecting guests and have it turn out badly. So I might become more adventurous over the next 12 months and turn out some new dishes next time. Were there any negatives of the experience? No. My biggest worry was not being able to find locally grown vegetables that I needed. Is there anything that could be better or that the Tassievore Eat Local Challenge could do to support your local food journey? As a meticulous, routinised meal planner (because most of the time I hate making meal plans and grocery lists) I would like to see more resources available around seasonal meal plans using produce that is available each month/season, as well as suggestions for substitutes if you can’t find particular vegetables in season when you need them. For example if you have a recipe that needs three or four types of vegetable and there’s one that you can’t get the local version of, what could you substitute for it? Overall, how would you rate your experience of hosting your Living Local Feast? 5/5 – fantastic. Good food, good company, good wine. SLT also suggested some conversation starters, which we didn’t cover in a lot of detail at the feast, but I did follow up with my guests later, and here’s a few of the points we came up with. Did you learn anything new about what local food is available in Tasmania? I learned that there is such a thing as Tasmanian goats milk feta. I wasn’t aware that there was an Tasmanian-made feta, so I’m glad to know this. Do you think you will try to eat more Tasmanian food as a result of this feast? The people that answered “no” said that they already try to eat as much Tasmanian food as they can. Do you think about the origin of food when you are shopping and eating? Most of us said that we did, and one person said that they will ask about whether produce is locally grown before they buy it. How easy do you think it would be to eat mostly Tasmanian for a day/week/month/year/forever? One person said that, other than a few exceptions, it’s quite easy to eat mostly Tasmanian most of the time. Others said they already try to do this. I think that if I was well-organised and had a good feel for what was available at what times, and had a good repertoire of dishes that didn’t rely on produce that wasn’t able to be grown locally, it would be fairly easy to have a mostly Tasmanian-grown diet, especially if I grew some things that I use regularly myself. One area where I’d definitely fall down would be days I want to cook things like curries where I need spices that we can’t grow here (and coconut products, which I use a lot of), and things that I use year-round that don’t store well (or that can be stored but that I run out of before they come back into season – or that I don’t have room to store). What are the problems with eating locally or supporting local business? People noted that this can be more expensive and that some things can be difficult to source, either because they have a short season or because they aren’t grown in Tasmania. One example that comes to mind is olive oil, which I use a lot of. Tasmanian olive oil is fantastic, but it’s very expensive, as I think most of the producers are relatively small scale, boutique producers who focus on quality over quantity. So, if you’re not in a position to pay a premium price for this, it’s unlikely you could commit to eating only Tasmanian olive oil. While I do buy small quantities of it for specific purposes, I don’t buy only Tasmanian olive oil. What would make it easier for you to shop/eat locally? I think the key is both in being more organised but also being flexible. If I can base my meal plans around what locally-grown produce is in season and, therefore, most likely to be available, it shouldn’t be too difficult. But then I also need alternatives – which I might not always know I’ll need until I’m at the shop – in case something isn’t available. And this has the potential to upset my plans! I like the way some stores label their fruit and veg bins so you know whether the product is locally grown, from the mainland or imported. Eumarrah gets a big gold star from me for this, because they go further and often provide the locality the produce is from. I think the Farm Gate Market in Hobart also provides this information in their weekly newsletter on what’s available at the market each week. These are my initial thoughts, and it’s an area I certainly want to explore further. So over to you – what do you think? If you have any thoughts, feel free to leave me a comment or if you have any ideas for the broader Tassievore community I’m sure they’d love to hear from you. You can contact Sustainable Living Tasmania here. If you’re looking for ideas on how to eat more local produce, the Tassievore website has some great resources for sourcing local food, including the Local Food Store and Market Directory. Tassievore eat local challenge – feast day! I learned last time I held a Tassievore feast not to be too ambitious. I’d thought about including a dessert on the menu like I did last time, but decided in the end it would make things too busy for me. I could have made a cold dessert ahead of time, if I’d really wanted to, but I’m trying to cut back on sugar, so I ditched that idea too. Last week I learned that proving my bread dough for too long and in too warm a room leads to bread that is edible, but visually unappealing. It basically spread out like a pancake. So this time I left it for a shorter time and kept it in a cooler room, and baked it at about 10.00 am. If you read my earlier post on the sourdough class I went to in March with Kate from Garden Shed & Pantry, you might remember the drama I had with the 12+ year old oven. We have fixed the problem with a shiny new oven, which is making cooking so much easier, and I’m glad we got it in time for this weekend. The result was much improved. At least it looked OK.
At the class, Kate explained how the climate affects the properties of the flour, and the end result can be dramatically different in terms of texture if you use flour from a colder climate (like Tasmania) rather than the flour she recommends that’s from a much hotter part of the country. However, the challenge was to use Tasmanian produce, so I stocked up on some Callington stoneground flour that was designed for bread making, and looked at the whole thing as a an experiment. I let the beef bones simmer away in the slow cooker for a few more hours, before straining it into a pot and letting it reduce. I have no idea how concentrated I’ve made it or what size portions I should freeze it in, but at least I now have beef stock. I was originally only going to do one dip, the smoked salmon one, but as I had more beetroot than I needed for the salad I decided to do a beetroot dip as well. That involved roasting the beetroot, stick blending it and combining it with yogurt and garlic. A lot of the afternoon was spent cutting up the pumpkin and the other beetroot for the soup and the salad. Cutting up a whole pumpkin isn’t something I do very often, and every time I do it, I remember why I don’t do it. I didn’t lose any fingers so that’s a bonus. I let the soup cook all afternoon, while I got the other dishes ready. For the chicken stock, I used what I had in the freezer. Whenever we have roast chicken I save the bones and, when I have a bag full in the freezer, I throw them in the slow cooker for 12 hours or so to make a basic stock. My aim was to serve the beef at about 7.30. It needed about two hours to cook (I like mine well done), so it needed to come out of the fridge at about 5pm. A minor disaster hit when I couldn’t find the mustard I’d bought the day before for the topping. Catastrophe averted when I found a jar of Tasmanian Rainforest mustard in the cupboard. This is from Hill Farm in Sisters Creek, and no one can remember where or when we bought it, but I’m very glad we did! Once the beef was in, it was simply a matter of remembering to put the vegetables in with enough time for them to be ready at the same time as the beef. I always forget that the beetroot takes a lot less time than the pumpkin when I make this salad, so I always end up with overdone pumpkin. One day I’ll learn. The honey-glazed carrots included honey we got from one of Slabs’ workmates, who has his own hives. That’s definitely the Tassievore spirit! The night was fun. I saw somewhere that it was World Cider Day, so Slabs had picked us up some from Wille Smiths. I don’t know who decides these things but I’m not going to complain. The bread was fine. It was a lot denser in texture than bread made from the flour Kate recommends, but still very good. And the beef (with the dodgy red wine sauce – the reason I made the beef stock) was great. We concluded the night with a selection of cheeses from Pyengana and Udderly Tasmanian, a pinot paste from Grandvewe and the crackers I made on Friday, which went soggy overnight, so I had to refresh them by re-baking them. In the end I was too focused on getting all the food together rather than having a discussion about some of the questions that the Tassievore people suggested as conversation starters in relation to eating locally. Although we did learn that you can buy Tasmanian feta – as used in the pumpkin and beetroot salad. Westhaven does a goats milk feta, which worked really well in this dish (along with the Tasmanian walnuts, which I substituted for the pine nuts in the recipe). I’m going to reflect on the questions that Tassievore has posed and put some thoughts together in another post, as I think this is already long enough. Thanks to Sustainable Living Tasmania and the Tassievore Eat Local Challenge for putting this opportunity out there. It’s definitely something I’m keen to continue being involved with in the future. Pumpkin soup: I have been using the recipe for years. I originally found it in the instruction book for a stick blender that broke years ago. So I’ve now publicly confessed that I’ve become somewhat more relaxed about sticking to some of the healthy life choices I’d been succeeding with, and have had a good hard look at why it might be a good idea to make some changes to get things back on track (she writes with a glass of wine in one hand). Good. Recognising that there’s something not right and, very importantly, identifying why I need to fix it is a good first step. But now I actually have to do the hard work, decide what I’m going to do and (shudder) do it! There are loads of areas I would like to have better habits in, but I know if I try to change everything at once, I’m not going to succeed. It will be too much in too short a time. There’s some reason out there in brain research world about why this is. It’s something to do with our caveman brain getting very agitated if things change too fast, and sabotaging our efforts because Change = Danger. So, the theories go, we have to trick caveman brain into thinking it’s safe by making only very tiny changes that don’t register with it. If this is right, the baby steps approach is in order. And absolutely no stepping on the cracks, because caveman brain would notice that kind of dangerous behaviour and step in to try and keep me away from danger. A concept I’ve read about in several places when you’re contemplating trying to make a change is, rather than looking at what you want to do, to ask yourself who you want to be, and then ask yourself what that person would do. Gretchen Rubin refers to this in her book Better Than Before as “the Strategy of Identity”. The basic idea is that: “Your habits reflect your identity, so if you struggle to change a particular habit, re-think your identity”. For years I thought of myself as someone who “hates exercise”, but at some point I realised that I hate sports . . . I don’t mind exercise . . . Thinking of myself as someone who “enjoys exercise” allowed me to change the way I viewed my nature, and that helped me to become a regular exerciser. I am someone who doesn’t regularly eat food with refined sugar. I am someone who doesn’t drink alcohol at home during the week. I am someone who gets 6-7 hours of sleep a night. Oooh! Dotpoints! This is serious. I think that if I tried to become that person in one big swoop, caveman brain would notice and would strongly resist, and I’d fail. Again. So I’ve decided to be that person on Mondays. The rest of the week, caveman brain can stay safe with the familiar. So now, what would dotpoint person do on a Monday? She might also think about taking all the cash out of her wallet when she goes out, so it’s slightly more difficult to buy the item in question. (She has a reluctance to EFTPOS small amounts, which might turn out to be a useful thing for this situation.) She also might decide not to walk past any tempting shops when she goes out at lunch time (including a certain clothes store). James Clear refers to the practice of setting up your environment in a way that will support your desired (healthier) habits as “choice architecture“. Yep, today she’s someone who doesn’t eat refined sugar. The same someone also doesn’t drink on a school night, but by the time Monday evening comes around, she’s tired and would quite like to relax with an alcoholic beverage. However, she knows that one leads to two leads to three leads to staying up late and being exhausted in the morning. Knowing the flow-on effect of one drink on her ability to be someone who gets 6-7 hours of sleep, she also has to be someone who doesn’t drink. 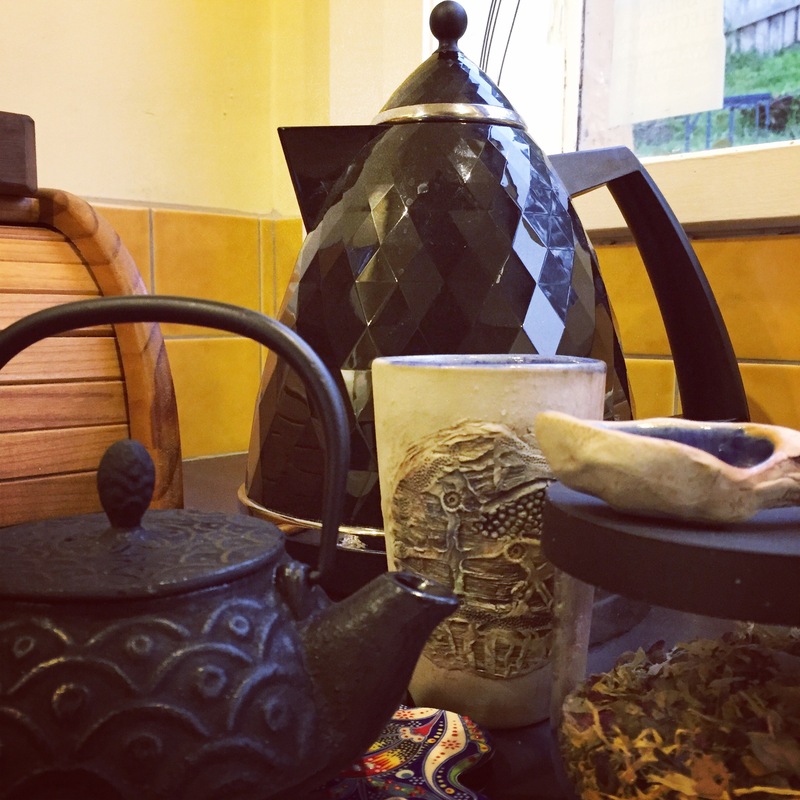 She has learned about choice architecture, and so she thoughtfully set up her teapot, tea and cup near the kettle, which she filled up before she went to work in the morning. They’re all there, making it easier for her to make the choice to drink tea rather than beer. She sits with her tea and writes in her journal. And when her 9.30 pack up alarm* goes off, she doesn’t have half a glass of wine left that inevitably seems to get refilled, or the decreased will power that alcohol appears to inflict on her, and she actually packs up and gets to bed by 10pm. These are the smallest of baby steps. In isolation, this is no big achievement. It will only benefit me if I keep being this person every Monday. I’ve already noticed how much better I feel on a Tuesday when I’ve had more sleep than I get on other nights. Wednesday morning me wants to be like Tuesday me, so Tuesday me will have to have almonds instead of cake and herbal tea instead of beer, and will have to go to bed on time. And within a few weeks, I’ll be that person I want to be without caveman brain Betty having noticed. It sounds easy. I’m sure it won’t be. So, in the spirit of trying new things out, this is an experiment to find out if thinking about who I want to be rather than what I want to do is an effective way to change a habit. If you think this might be a helpful strategy for a habit you want to change, tell me about it in the comments, and we can cheer each other on. I’ve been interested in sourdough breadmaking for a while and have tried making it a few times, but have never been very happy with the result, so I decided I needed some professional help. A couple of years ago a friend told me about sourdough workshops that Kate Flint runs out of the Garden Shed and Pantry in Cygnet. Lil Sis and I had talked about going ever since, and were going to gift a ticket to each other for Christmas in 2015. It never really happened, and I kept getting the emails about the workshops and never got around to organising to go. This time I said to Lil Sis that we were going, we booked, organised some accommodation for the night and on Friday afternoon we set off. The workshop was run in two sessions. The first one on Friday night, was where Kate introduced us to sourdough and we made our dough using Kate’s starter. We then had to leave it overnight for an 8.30 start the next morning. Before we left for the night, Kate showed us how to make cultured butter. The next morning, we went to the second part of the workshop, which was basically pulling the dough out of the proofing bowl, shaping it and getting it ready to cook, which was meant to happen about 1.5 hours later. Dough at the beginning of Day 2. After we’d done that, Kate demonstrated how to get the dough into the oven, and her three demo loaves cooked while we were there. These look great! I need to get one of those cast iron pots. Lil Sis and I put our dough into the fridge until we were ready to go, because Kate had said not to leave it out for much more than 1.5 hours before baking it, and we had a longer trip home than most of the other participants. We got to try a selection of Kate’s breads for breakfast, which she had given us recipes for as well, and were able to stock up on supplies from Kate’s shop before heading home with our dough. It took about an hour from Kate’s place to my place, maybe a bit less, and I kept the dough on the bench while I heated the oven, so it was out of the fridge about 90 minutes all up. The instruction was to heat the oven and baking stone or pot to 240 degrees initially. Now what you need to know is that one of the many quirks of this house is that the temperature on the oven dial is not the temperature that the oven actually is – so there is a baking thermometer in there to monitor that actual temperature. I heated the oven and the pizza stone to 240. All good. Possibly put too much flour on the pizza stone, as I set the smoke alarm off. At least I know it works. Tipped out the dough (forgot to slash it, never mind), filled the bottom tray with boiling water and put the dough in. Got my water sprayer and sprayed water into the oven as Kate had suggested to do if you didn’t have a pot with a lid to create steam. The temperature dropped to 150 or thereabouts. I expected it to go back up to 240 or so. I sat in front of the over for 35 minutes despairing as the temperature sat solidly on the 130-150 degree mark, depending on whether I believed the thermometer or the oven dial. Completely panicking! Slabs suggested I had interfered with the oven fan with the water spray as it’s a fan forced oven. I don’t know. Does steam work in a fan forced oven? I hadn’t even thought to ask this. Then finally about 35 minutes in, the temperature started to go up again. I had no idea what to do at this point, because according to the directions Kate gave us, after 35 minutes at 240 degrees, I was supposed to reduce the heat to 180. But it hadn’t even got to 240, let alone 180. I decided I had nothing to lose, so I let it go for 25 minutes in the increasing heat. According to the thermometer, it got to about 220 in that 25 minutes. By that time it was starting to burn on the outside so I had to stop and hope it had cooked on the inside. So then there was the anxious wait for two hours to cut it and see what it was like on the inside. One of my baking friends asked if it sounded hollow when I tapped on it, which it did, so that was apparently good. And when I did cut it, it looked pretty good, much to my surprise. In fact I’d go as far as to say that it’s the best loaf I have ever made, so something went right somewhere! So I was happy with the result and now that I know what I’m doing (I think) I’m going to try this again. You know what a great idea it had been to get up early and see the Twelve Apostles in the morning light? Well for the Blue Lake of Mount Gambier, this didn’t work as well. We saw the sun rise, but the lake looked less blue than it had appeared yesterday. Still there was a pretty cool effect of fog appearing to be pouring into the lake, so that made the early start worthwhile. We also discovered that the Leg of Mutton lake, so named for its shape, was actually now called Leg of Mutton Lake Crater because, well, to be a lake I imagine having water would be a requirement. So that’s two of the four lakes dried up since 1979. We then began the search for a cafe open at 8am. A quick lap of the main street revealed nothing, but trusty Google found us at Cafe Melzar, carefully hidden away in a side street, which opened at 8am. We arrived at 7.57. It was the best breakfast of the trip so far (yes I did have southern fried chicken with waffles and maple syrup and it was delicious), and the best coffee. Recommended. Today was to be the big drive through the Coorong so we wanted to be on our way as early as we could. Driving out of Mount Gambier it was kind of cool to know we were driving over the top of the Engelbrecht Cave. We walked to the end and back, had coffee and hit the highway again. We decided not to go to Robe, but stopped in Kingston SE for lunch. We saw the old Cape Jaffa lighthouse, which had been constructed in the 1870s and when it was decommissioned it was taken apart and reconstructed in Kingston in the 1970s. There was also a life boat from the Southship OLIVA that ran aground in the Nightingale Islands in 2011, and the lifeboat washed ashore in the Coorong two years later. Then it was time to hit the Coorong. You can’t actually see much (anything) from the highway. I can’t remember where we went in 1979. There’s an old dirt road between the highway and the beach, and a 4WD track on the beach and I can vaguely remember driving along something like that. Unfortunately circumstances dictated that we didn’t do any of this, and so we ended up driving straight through to Meningie, on the shore of Lake Albert. It’s a tiny town and we stayed at the caravan park. In a cabin, thankfully, after the wild weather that his us during the night. I went for a walk along the lake and was happy to see pelicans, since we missed the pelican observatory on the Coorong. We had dinner at the restaurant that was part of the museum complex over the road. I had Coorong Mullet, which we’d seen advertised for sale at several places on the drive. It’s also called Yellow Eye Mullet and it was very tasty. And that was it for a quiet Saturday night. Our longest drive was over and we kicked back after dinner with a couple of fantastic beers from local brewery Robe Town Brewery.